Distance Learning ATPL Ground School Training is delivered by UK-based Pathway Pilot Training (path2pilot.com) for your CAA exam qualification - wherever in the world you are located. It is a flexible and personalised part-time course lasting from 11 to 19 months. So you can fit your studying around your other commitments and time available per week by choosing a learning pace that will suit you. Your individual study plan will be agreed with you in advance. You can also attend up to 5 revision (brush-up) weeks immediately before each exam session. 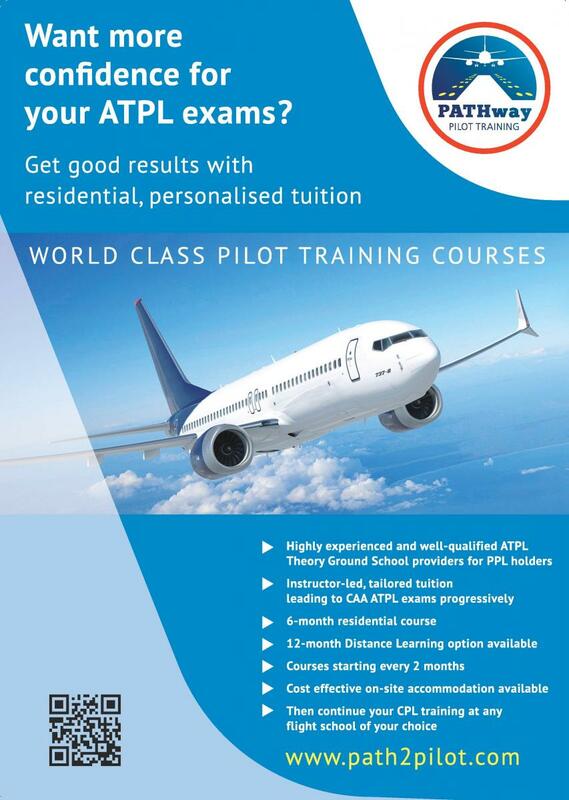 The 14 CAA theoretical exams are the best possible qualification and recognised as such by all airlines worldwide. But they are very demanding, so intensive study is required to pass them. Pathway will deliver a high quality and personally tailored exam preparation service wherever you are located. Industry leading Pad Pilot reference material - electronic iBook format for ease of study anywhere. Access to the industry-leading question bank available during the course and for revision weeks. In-depth, instructor led, revision weeks before each CAA ATPL exam session. Courses tailored to your available study time: e.g. Min 11 to max 19 months, 5 revision weeks and 5 exam sittings. Courses starting every 2 months. Up to 5 residential Revision Weeks in Scotland (or Florida). In a nutshell - better results for you. In this highly competitive industry, our well-proven theory courses will give you the most solid foundation for the CAA exams, the expensive flying phases and your airline recruitment interviews. Lack of understanding will be exposed and may lead to slow progress, exams failures and repetition of flight tests. Building intensively and progressively, our course will give you the best chance of passing the necessary CAA ATPL exams with high marks as our track record demonstrates. All our graduates to date have achieved average results of well above 80% in the 14 exams. In addition to Pathway directly delivering your course as an independent school, we are very proud to have been selected by both European Flight Training in Florida and ACS Aviation in Scotland to provide their ATPL Ground School as part of their overall training package. Our courses can be based either in Scotland or Florida as required by the student and our dedicated TKIs (instructors) and classrooms are available at both locations. Our instructors and material are high quality and second to none, your tuition is personalised and overall costs excellent value for money. In the classroom for revision weeks, morning lectures and afternoon tutorials/practice questions enable you to focus on the essentials from the huge volume of information presented, studying and passing the exams progressively to spread the load. Airlines recruiting look closely at all exam/flight test reports and look for good results, so give yourself the best possible start. Even if you have been studying elsewhere, you are welcome to attend our revision weeks in Scotland & Florida. These are scheduled every 2 months, geared to the CAA exam centre timetables and the particular module subjects on the residential course. You will get an accurate assessment of your readiness to take your CAA exams, perhaps avoiding a potential fail!